We all know that familiar dread deep in the pits of our stomach when we first wake up: we cautiously touch our faces, probing for the telltale signs of a new breakout, whether it’s the rough and bumpy texture of comedones or the searing pain of a burgeoning cystic outbreak. 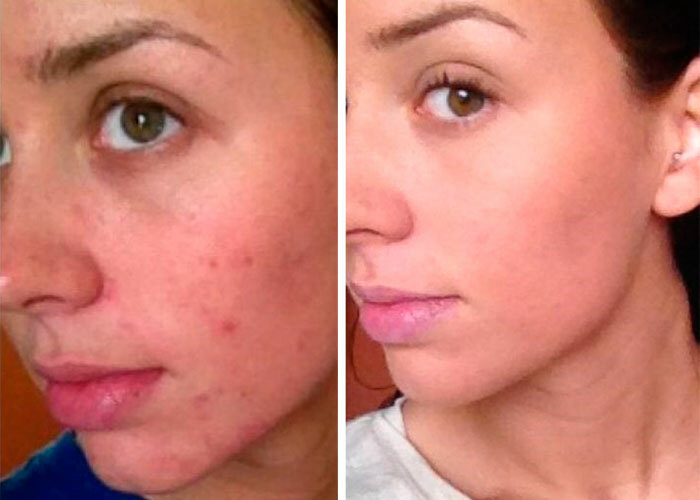 Having acne is one of the worst things a person can experience, and the effects of this disease can be devastating. Coconut oil has many wonderful properties that can help treat acne on your face and scalp, and if you’re curious to see how it can help you, then please keep reading to see how this common cooking ingredient can give you clear, glowing skin once and for all. Is Coconut Oil Good to Use for Acne Scars? Coconut oil isn’t just for cooking anymore! This antioxidant-laden ingredient has shown that it can help deliver clear, beautiful skin to acne sufferers of all ages. The effects of pregnancy hormones can be devastating on a young woman’s face. Where there was once smooth, even skin, there’s suddenly a rash of angry, red bumps. Pregnant women can rest easy knowing that coconut oil is entirely safe to use during their pregnancy. While coconut oil is all natural and generally considered safe for the general population, use caution if you have a family history of tree nut allergies. Please talk to your physician before starting any coconut oil regimen. If you’re pregnant and struggling with some unwanted spots, a thin layer of this rich oil can be exactly the cure you seek. 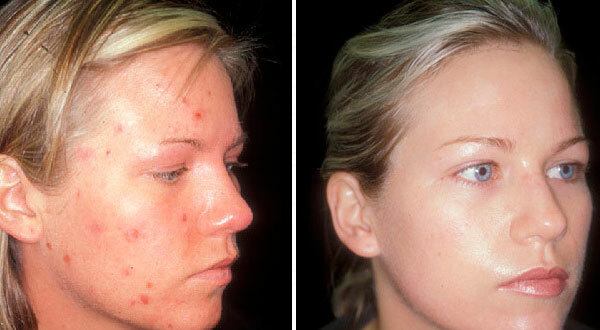 For more information on natural remedies for acne, click here. Cystic acne is arguably the worst kind of acne that you can suffer from. It leaves hard, angry welts that seem to last forever, can’t be popped, and leave lasting, pitting scars. Start by washing face with a gentle cleanser. Medical reviews suggest that harsh cleansers can be too stripping, making your skin worse in the long run. Add a thin layer of coconut oil to your entire face. Don’t worry about getting it into your hair; it’ll rinse out easily in the shower. Using a clean cotton swab, gently apply tea tree oil to the inflamed spots on your face. Don’t pick at the spots. Click here for more information on using tea tree oil for acne. If you have long hair, pull it away from your face. Change your pillow case each night to prevent oil from your hair from transferring to your face and causing more breakouts. If you follow these steps, you’ll have clear skin very soon! Scalp acne is like discovering an unwanted hidden treasure: you’re casually running your fingers through your hair, then you feel the sharp pain and the raised bump. While it’s easier to conceal than facial acne, it can be somewhat more tricky to treat. Allergic reaction. Did you recently use a new hair product? It may be causing a rash that looks suspiciously like acne. Heavy, waxy conditioners. While they may make your hair soft and lustrous, they can cause pore-clogging buildup. Starting a new exercise program. Be sure to wash up immediately after working out to prevent unwanted break outs! Fluctuations in hormones. No matter your age, you can have changes in your hormone levels, which can cause breakouts. Changes in diet or lifestyle? Stress and lack of sleep can cause acne flares, too. A healthy diet can help stop breakouts before they start. You can treat scalp acne by using a coconut oil mask. As an added bonus, your hair will absorb this healthy oil, making it stronger and more sleek. Mix a few drops of tea tree oil into organic coconut oil (1-2 drops per tablespoon) and massage it gently into your scalp. Let it sit for an hour, then rinse out with shampoo. 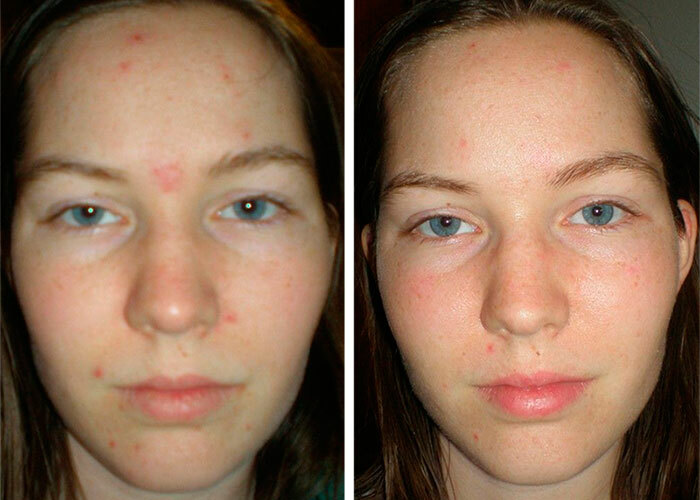 Some people seem to mistakenly believe that using oil can cause acne breakouts. The truth is, coconut oil is one of the best things you can apply to sensitive, acne-prone skin. When your face is stripped of its natural oils, it has to overcompensate by creating more of its own oil. This oil mixes with sebum, which clogs pores and clogs your skin. A gentle cleanser washes your face without causing a rebound reaction. Coconut oil is anti-inflammatory. Coconut oil reduces redness, swelling, and irritation. Coconut oil is antimicrobial. It kills the P. acnes bacterium that causes breakouts. Coconut oil is full of antioxidants. It shrinks your pores and makes your skin glow. Coconut oil prevents overproduction of sebum. Coconut oil halts acne-causing sebum in its tracks. Coconut oil is rich in skin-nourishing Vitamin E.
Sometimes acne can crop up on your back, causing back acne. Your hair can cause these breakouts, or sweating, or tight clothes. Coconut oil works wonders on these breakouts, too; it’s not just for your face or scalp! You can exfoliate by mixing baking soda with coconut oil. 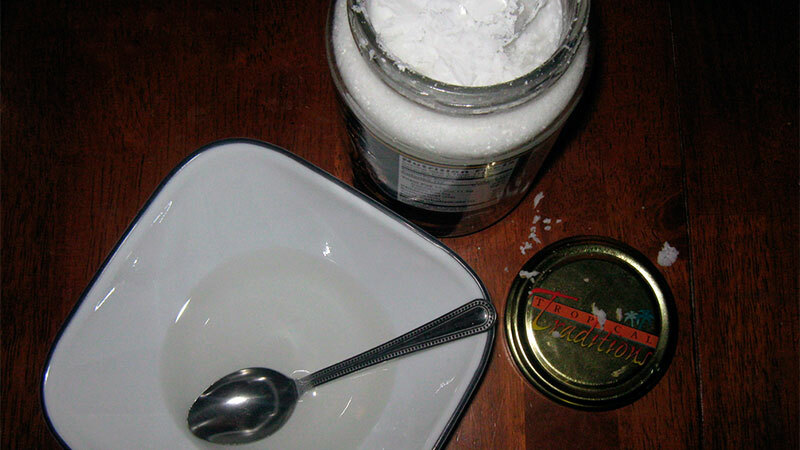 For more tips about using baking soda for acne, click here. By drinking ample water, you can keep your skin hydrated and healthy, preventing acne zits. Aloe vera mixed in with coconut oil makes an amazing tincture that provides a double-whammy of all-natural acne fighting power. For more information on using aloe vera for acne, click here. While there are no inherent dangers of using too much coconut oil, you don’t want to over-apply it. If coconut oil is so safe to use, why would you want to be prudent about not excessively using it? Using too much coconut oil on your skin and face can be costly. Over time, if you find yourself dipping into the jar too frequently, you can find yourself being wasteful. Using too much coconut oil can destroy your wardrobe. Coconut oil can be very staining, causing permanent damage to your clothing. Using too much coconut oil can put you at risk of slipping and falling in the shower. Coconut oil doesn’t dissolve easily and can build up on the floor of your shower, increasing your risk falling and injuring yourself. Not only is coconut oil a fantastic acne treatment, it also lends itself to numerous other applications. Makeup remover. Coconut oil can dissolve heavy, greasy cosmetics without tugging on your delicate skin. Eye cream. Nothing zaps wrinkles quite like coconut oil. A small dab will roll back the hands of time by years! Mix equal parts of coconut oil and coarse sugar and rub it gently onto your face, revealing the healthier skin underneath. Lip balm. Soothe chapped lips with this tasty oil! Since it’s safe to eat, you don’t have to worry about consuming strange chemicals, either. Your makeup will have a soft glow to it that will make you look radiant! For especially acne prone skin, you can take a cotton ball to your face after washing it to remove buildup. If you think coconut oil is magical on your face, wait until you use it onto your skin! To combat “ashy” skin, massage coconut oil into your knees and elbows. Coconut oil makes a fantastic substitution for skin lotion. If you have chapped and bleeding hands and feet, you can make an extra virgin treatment mask for healing repair. Run out of shaving cream? Coconut makes for a smooth shave without nicks! The healing properties of coconut oil also works wonders on scars on your body. Smear this oil onto old or new scars and watch them vanish before your eyes! Since coconut oil is so high in antioxidants and Vitamin E, it can effectively and permanently reduce the appearance of acne scars. While it’s natural to be impatient and want the scars to fade overnight, it takes patience and consistency. Apply this oil 2-4 times daily and expect to see results in as soon as a month. Anti-fungal, anti-inflammatory, and anti-bacterial properties. Shrinks pores and reduces the appearance of wrinkles. Is a powerful deep conditioner. Safe to use on people of all ages. And that’s just barely scratching the surface! The benefits of this healthful oil are bountiful and easily seen with even a little bit of usage. 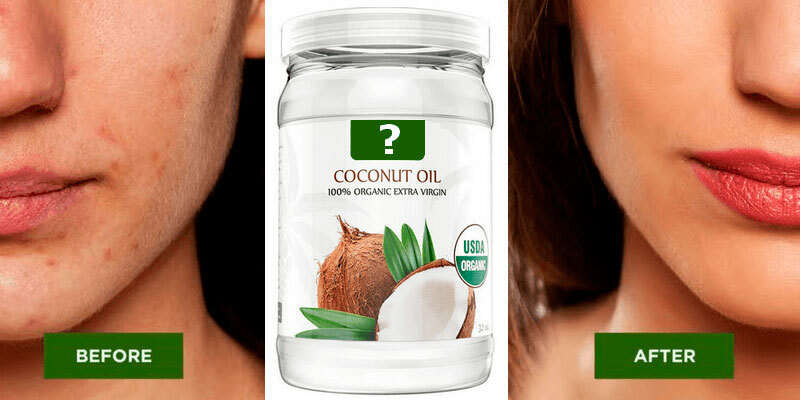 What Kind of Coconut Oil is Best for My Skin? Not all coconut oils are created equal.To avoid unwanted exposure to pesticides and to retain the most nutrients from the coconut oil, reach for raw, organic, cold-pressed, extra-virgin coconut oil. Seeing is believing. If you need proof of the powerful benefits of coconut oil, look no further!